Today, thanks to the addition of independent suspension and front wheel drive, axles don’t just have to rotate. They have to flex while rotating and they have to do it smoothly in every direction, no matter how extreme the angle. That’s why manufacturers created the constant velocity joint, or CV-joint. It allows the axle to twist and bend while continuing to provide power to the drive wheels. At your local Columbia, SC Cottman center, we’re very familiar with CV-joints. We’ve been working on them since they first showed up over 30 years ago. Since then, parts have become more accessible and prices more reasonable. So at our Columbia, SC Cottman location, we can not only repair your car or truck CV-joints, we can do it at a great price. Of course, not every car needs a new CV-joint. The most common problem with a CV-joint is a torn CV boot. That’s the part that keeps the grease in and the dirt out. At Columbia, SC Cottman, we can examine your car’s CV-boots. If they’re torn, we can check the CV—joint and see if it’s still in good condition. If so, we’ll clean out the dirt, repack the CV—joint with new grease, and replace the CV boot with a new one. If the CV—joints are worn out or damaged, we’ll repair it or get you a new axle, and all at a terrific price. 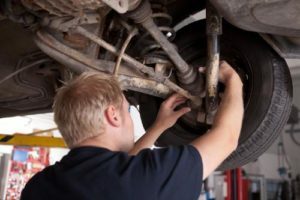 If you have a question about your car’s CV-joints or boots or would like to set up an appointment your CV-joints and boots checked or repaired, call Columbia, SC Cottman right now at 803-748-7800.